I was opposed to riding with heavy wheels and tyres for a long time, years in fact. I believed that training with heavy wheels and tyres would slow me down and take away that beautiful carbon wheel feeling. But after riding with The Hurt Box for almost twelve months now, I have come to understand the benefits of training with an increased wheel load. Before we get started let’s define what “heavy” means. A heavy wheel set is robust and normally weighs between 1,600 and 2,000 grams. A set of Fulcrum 7’s would be a great choice. A heavy tyre is thick, robust and has traction. The Schwable Marathons are awesome! 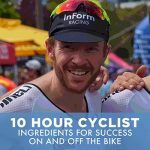 I sat down with Harry Hanley (Cycling Coach at The Hurt Box) to talk in depth about the benefits of training with heavy wheels and tyres. 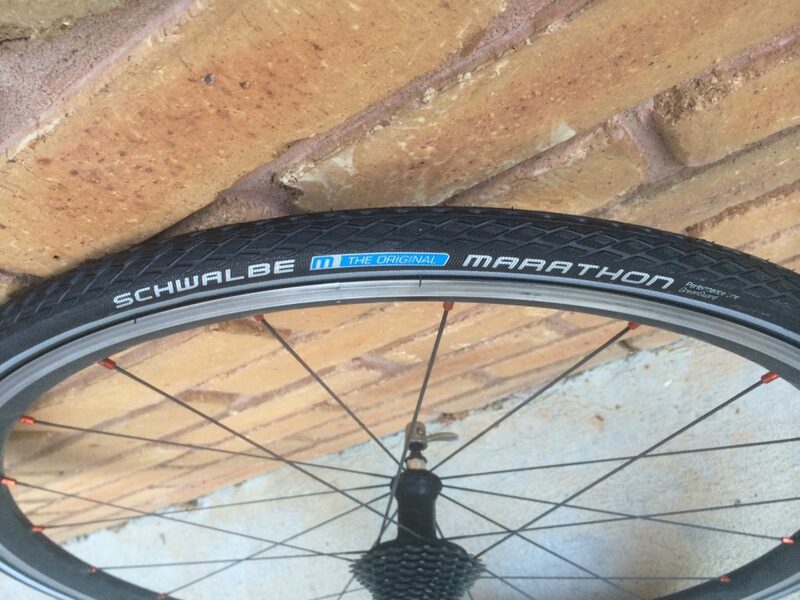 You won’t go wrong with a set of Schwalbe Marathon tyres. If you were looking to build strength at the gym, would you select lightweight dumbbells because it’s easier to produce twelve repetitions? Or would you select the heavier weights that require more effort? In cycling, torque is the measurement used to determine the force required to propel the wheels in motion. Your ability to create torque is ultimately what powers you forward. Heavy wheels and tyres will result in the need for more torque and thus more effort from you – just like lifting heavier weights in a gym will require more effort. When you’re riding in a group, it would be fair to say that a majority of cyclists within the bunch are using either lightweight alloy wheels or carbon rims. If you’re training on heavy wheels and tyres within the same group, your additional effort is likely to be in the vicinity of ten to fifteen percent greater. If you’re riding with this group five to ten hours per week, that in itself will make you a significantly stronger cyclist. Heavy wheels and tyres are going to slow you down, so you must generate more effort in order to keep up with everyone around you. That’s tough at first, but over time it becomes the norm. Your mindset will start to shift within weeks, and then you just end up getting on with the job. Almost unbeknownst, you’re becoming a tougher cyclist. When you put your light-weight wheels back on your bike it feels like you’ve taken some type of unbelievable drug. The bike feels vastly different, and you feel fast. This is the mindset you want to take into a race or even a local bunch ride you want to tear apart. Not only does the bike feel lighter, but you’ve inadvertently become more of an animal – all from training with more torque. Everyone in The Hurt Box group of roughly twenty to thirty cyclists rides with heavy wheels and tyres. In the past twelve months we have not stopped once because of a puncture and when I hit potholes or unforgiving bumps I don’t stress about cracks in the rims. I don’t even contemplate stopping to see if any damage was done. I’ve even started riding through broken glass. The confidence is sky high! Whether you race professionally in the amateur leagues or you just want to dominate your local bunch ride you should only bring out the lightweight aero wheels when you want to ride fast. Any other time should be reserved for the heavy tyre and wheel combo. This will ultimately make you a stronger cyclist – and remove the stress of punctures! Great article, love the concept. Out of interest, are you running 25c or 28c Schwalbe Marathons? How true that article is. One better is to train on a heavy alloy bike and keep up, if not drop those guys with carbon bikes an wheels. Certainly made me a lot stronger rider. Did this year’s ago in the early 70’s . However we would often have a training bike fitted with lights and a few creature comforts . Most of us would have an old race bike fitted with a dynahub to power a large head light and steel rims. So you had an increased load as well as the weight of the rims. Come race day out come the good stuff most raced without gears just a free wheel. 48 to. 16 gave if my memory is good 86.2 this was the max gear allowable for our age group. It’s funny how things go full circle. Being a sports fan, this blog was an amazing read. Sports is such a genre which needs informative as well as stimulating facts and information, thanks for sharing!